So I decided to see how much I could lower SOC voltage while still keeping my RAM stable. Turns out I could drop it by 0.100v, from 1.025v to 0.925v. Haven't tested if SOC voltage affects CPU temperatures much, if at all. I'll do it some time later and edit this post with some info. Tried increasing SOC and CPU voltage to no avail. Last edited by BLUuuE; 02-14-2019 at 10:23 PM. to make a pass . Out of curiosity -- what are other people's CPU idle temps and RAM temps? I'm not concerned so much with how high or low your CPU idle/RAM temps are, but more the difference between CPU idle and RAM temps. My CPU idle and RAM temps are usually the same. MSI X70 GAMING PRO CARBON. G.Skill Sniper X F4-3600C19-8GSXKB (2x8GB single rank) A2, B2 slots. My setting for bios below. All other settings are auto. Trick part is that I selected 3333 CL16 then switch to 3533 CL16 that works for me. 3533 is missing in "Memory Try It !" is magic gem. This method what I did in bios is really simple. 1. I selected 3333 16-18-18-18-36 under Memory Try It ! in bios then. 2. I selected 3533 under “Dram Frequency” then save bios and exit. 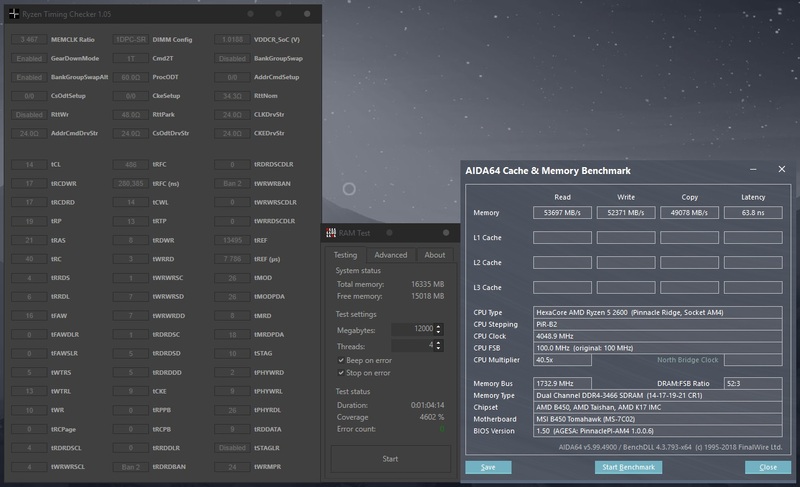 Benchmark, Gaming, others works fine. Do you happen have same ram kit but similar and MSI motherboard ? You can try this method to see if it’s works for you. I'd look to lower SOC to anything below 1.1V as I don't see any stability gained that high and more frequently the opposite. I used to recommend 1.1V as a catchall, but have found that because of either my own previous misunderstanding or AGESA updates it isn't nearly necessary. At this point I've found 1.0V to be perfectly sufficient and absolutely stable. I'd also start work on lowering your tRFC. The motherboard frequently sets it too high for stability and hopefully that is your case and you can successfully lower it. I just lower soc to 1.1 and I set 462 for trfc as you suggested. I used RTC to look at trfc number for safe present. Update the result score below. No, problem. I'd try SOC at 1.0V and run a quick test. It will be obvious real quick if that's severely unstable. And if it is only close to stable then it's a good sign you can use less SOC which means less voltage through the CPU and that's always a plus. For 8GBx4 :: RttNom, RttWr and RttPark, need a proper value to boot up otherwise it will cause 3 bios beep or ClearCMOS. 1.Why 4 sticks of RAM need Rtt values ? 2.How's Rtt relate to each other(Nom/Wr/Park) ? Last edited by Nick Moiré; 02-28-2019 at 12:18 PM. 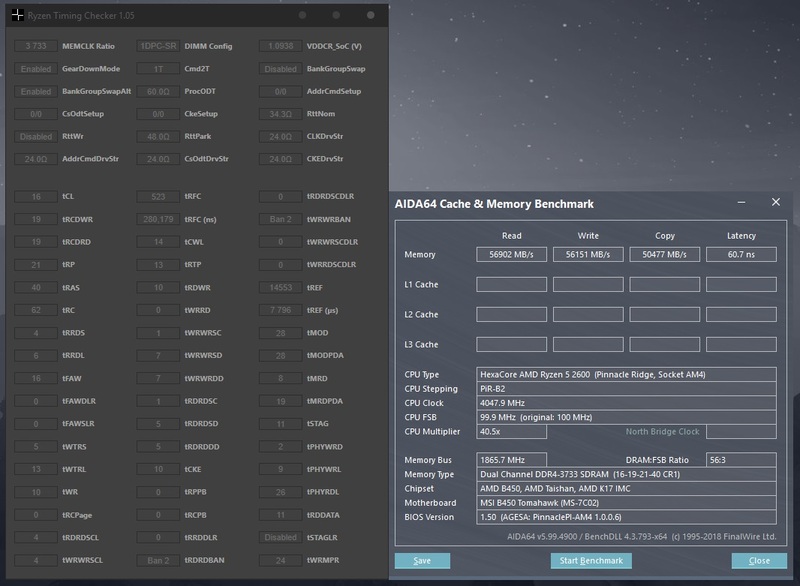 I can boot 3733MHz and run AIDA64 memory benchmark, but not much else. Limited by my IMC.